Yes, we are still on this band-wagon. 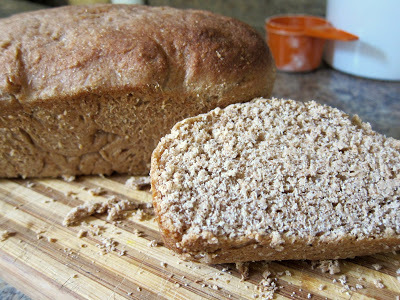 And, while I can’t say I know for sure that in health we’re a whole lot better off, we have completely replaced sandwich bread with homemade sourdough, and slowly I’ve begun using our sprouted flour in all of my baking. Sadly, the effect has been less baking, but I’m catching on to the process, and really enjoying the exploration. The hardest part, by far, is milling the grain. Though the mill works great, it takes longer than I expected and is loud. If we had a garage I’d stick it out there and let it go, but as it is the kitchen is the only suitable milling area, making the rest of the ‘great’ room sort of uncomfortable on account of the noise. Never-the-less, I’m here to say that I’m really looking forward to exploring this more. 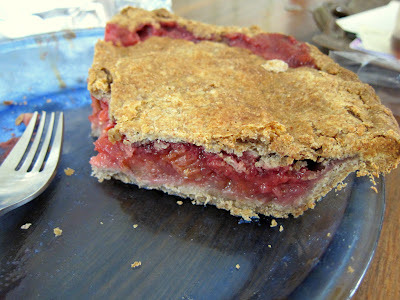 And, to show some pictures and share some reviews of what baking with sprouted whole wheat flour looks like around here. 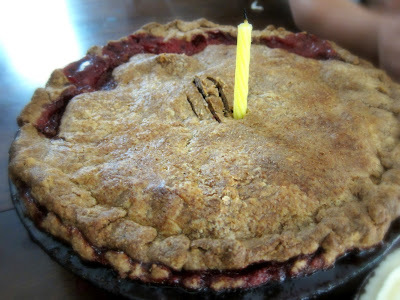 Then there was Drew’s birthday Strawberry Rhubarb pie. The courseness of the flour made me worry about the crispy texture everyone loves in pie crust, I was afraid of rubbery and tough pie that might ruin the little surprise I whipped up for him (he claims this pie is the reason we’re married, so there’s a bit of pressure whenever I make one). But, the only difficulty was the darkness compared to regular unbleached white flour–it was a bit difficult to tell when the crust had browned because it’s darker, but by keeping a close eye on it and watching for ‘moist-ish-looking-bubbles’ on top to disappear, I think I figured it out, and I haven’t heard much but the smacking of lips from Drew–and of course the ‘this is how your mother tricked me into wedlock’ anecdote he loves sharing with the girls. Everyone wanted seconds and thirds and the rest hides safely in the back of the fridge for Drew to devour (and share bits with me) at his leisure. Even if you don’t sprout, just milling your own flour adds back much of the nutrition you lose in flours from the store which is either rancid or full of preservatives. So, search out a mill that might work for you and if you find a whisper quiet and efficient one, let me know. Thanks. This post came at such a good time, because I have been having a lot of trouble process grains since I have birth to Landon, and I have been playing a lot with sprouting to help see if that will make a difference. Thanks for sharing your thoughts. i think it will help! i believe hormones contribute to the imbalance that can happen in your gut, but once that's good sprouting & soaking help to keep it so. I use a grain grinder attachment to my champion juicer. It's super noisy but does the trick. What do you use? I've also found you can just use the soaked, sprouted grains before they're dried, just cut way, way back on other liquids. I throw them in the cuisinart and blend them to a dough consistency and then add the other ingredients. I get major allergies, stuffy nose etc from wheat unless it's soaked and sprouted. oh wow! I'm going to have to try that. do you have any recipes you could share? We're using the KitchenAid attachment, and aside from the noise it does work really well.